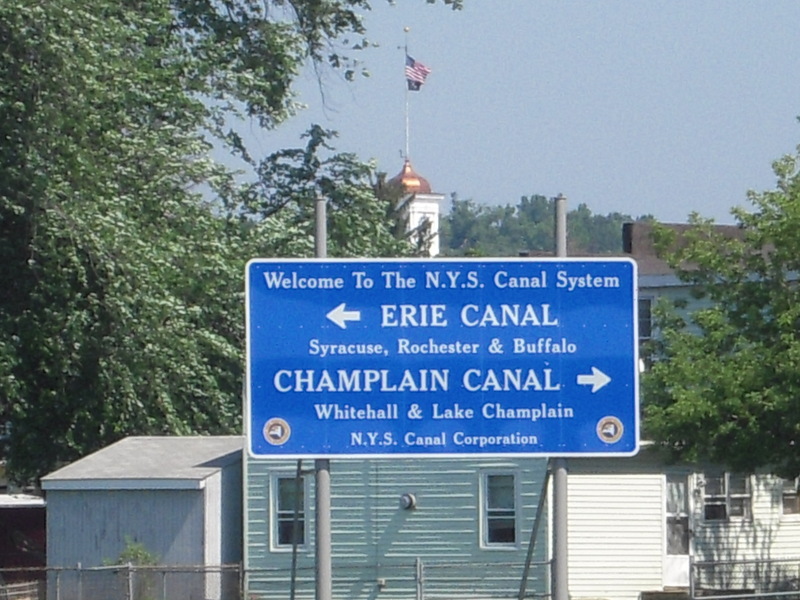 The New York State Canal System is comprised of four major canals: Erie, Champlain, Cayuga-Seneca and Oswego. The Erie Canal is the backbone of the system. The “Eastern” Erie extends from Albany to roughly Oneida Lake (Syracuse). The “Western” Erie extends from roughly Oneida Lake to Tonawanda/Buffalo (Niagara Frontier). The four major canals are all navigable by cruising boats. Additionally, the canal system includes several smaller canals that are no longer navigable except by canoe or kayak (Chenango, Chemung, Crooked Lake and Genesee Valley canals). 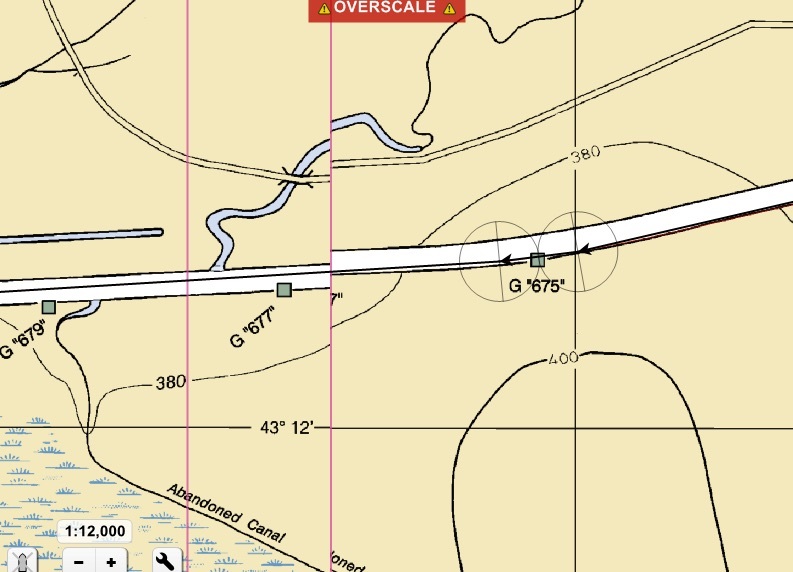 There is an “official” NOAA navigational chart publication that contains all of the individual nav charts of the waterways of the NYS Canal System. The portion of the Erie Canal West of Lyons, NY, is not covered by NOAA charts. The chart pack reference is: Recreational Chart No. 14786, “New York State Canal System,” NOAA, 13th Edition, 2001/09/08. NOAA charts are only produced for the portion of the Erie Canal between Waterford, NY, and Lyons, NY. West of Lyons, cruisers will want the Cruising Guide for the Canal System (see more on this, below). A useful alternative to the printed NOAA Chartbook for the NYS Canal System, for those interested, is the “Richardson’s Chartbook and Cruising Guide: Hudson River and Adjacent Waterways,” by Richardson’s Publishing. The Richardson’s chartbook includes all of the available charts for the Erie Canal, as well as charts of other regional waterways. In the case of the NYS Canal System, we recommend still another “chart alternative.” We recommend cruisers obtain the NY State publication, “The Cruising Guide to the New York State Canal System,” from the official NYS Canal System website, here: http://www.canals.ny.gov/index.shtml. The NYS Cruising Guide is a mix of traditional Points-of-Interest cruising guide content and navigational charts. The pictorial content on its pages show navigation hazards, soundings where needed and the location of numbered lateral marks, by color. It is a lot like a AAA Road Guide, except designed for use on the water. Sanctuary and crew feel it is very well done, and on this closed waterway, eliminates the need for traditional navigational charts. The Canal Corporation publishes a very useful information packet entitled, “Boater Resources.” Download it from the Canal Corp website or pick up a copy at one of the Canal Welcome Centers. This small publication is a required supplement to any/all of the chart alternatives, and cruising boaters need to have it aboard. Turbulence at downstream lock gate during “dump” of water from the chamber. 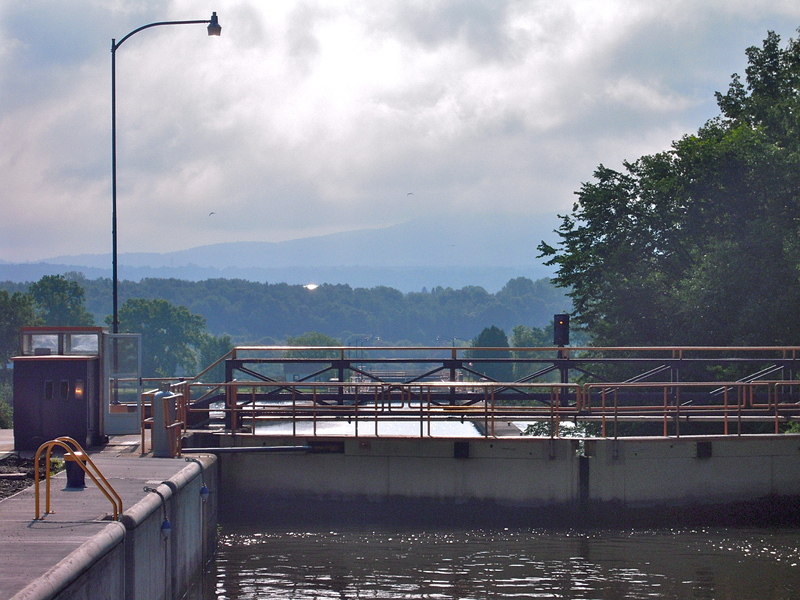 The locks on the NYS Canal System are 300′ long and 44.5′ wide. The lock chambers of medium-to-high elevation move 350 million to 400 million gallons of water per locking cycle. Vessel operators should be prepared for the possibility of strong cross-currents when entering and exiting locks. Stay well away from the downstream gates of locks that are full of water upon arrival, since that is where water will be discharged from the lock when it is “dumped.” The process creates strong, sometimes violent, currents close to the lock. Locks generally have 5/8″ – 3/4″ three-strand nylon lines hanging from the walls which vessel operators must hold to stabilize their vessels in the locks. The lines are placed at intervals along the lock walls that accommodate vessels of all size. These lines are often covered with marine slime, and line handlers will want to wear gloves. Locks E-32 (Pittsford) and E-33 (Rochester) have both fixed cables and 3-strand lines. The lock combings on these locks are low enough that it may be difficult for boats with high freeboard to reach the cables when the lock is filled with water. The locks on the NYS Canal System do not have floating bollards. Boaters must avoid crowding other boats, particularly in the deeper chambers, because boats will move forward and aft on the lines as the water fills and empties the lock. Do not cleat lock lines to the boat when the lock is emptying, because if that line were to jam, the boat would get hung up, literally (a very bad situation). Some lock walls are smooth, others are quite rough. There are large bollard recesses in the deeper locks for use by work boats and barges. Locks fill and drain by gravity via culverts located along the center of the lock floor. When filling, boats will tend to get pressed against the walls. When emptying, boats will tend to drift away from the wall. Line control is extremely important, and does require some agility and physical strength. Lock walls are covered with marine slime, and are unpleasant to touch. Many boaters carry push poles to use in fending boats off lock walls to ease/release the tension in fender attachment lines. Fenders can get hung up in divots in the wall, as well as fixed bollard recesses. We use the handle of a boat hook for that task. It is generally OK to choose which side of locks to tie up, but as in all things, follow the lockmaster’s directions. 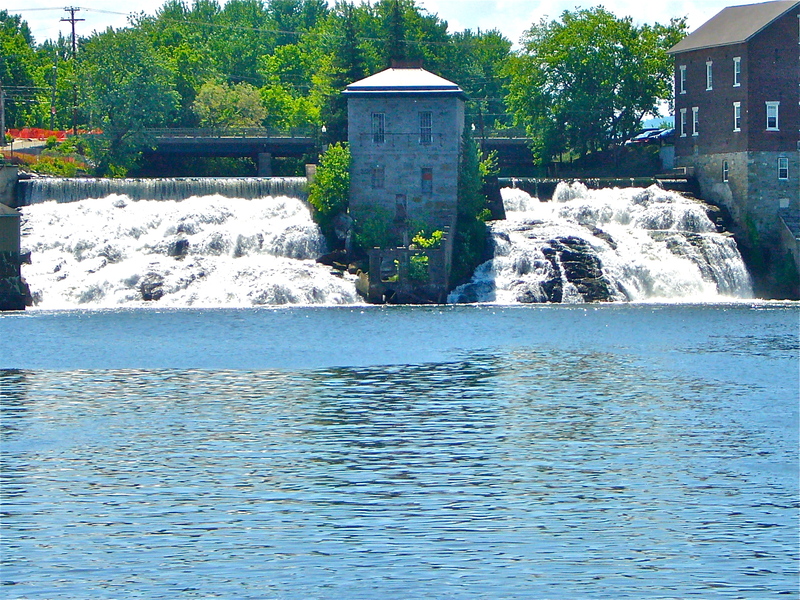 At Lock E-17 (Little Falls), for example, boats must tie to the south wall, because the water races that fill and empty the lock are located along the north side wall of the chamber. The downstream gate of Lock E17 is extremely unusual, and for those with mechanical engineering interests, will be an item to photograph. Measured from their normal low water level, lock chambers range in elevation height from about 8′ up to over 40′. 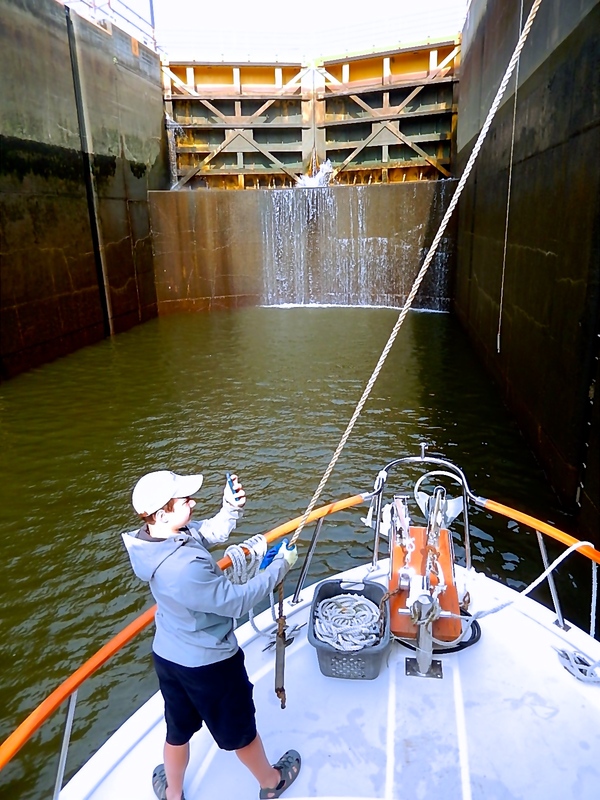 Controlling a boat at the bottom of a high elevation lock can be a challenge. For best advantage, decks should be clear so that line handlers can move unobstructed to the side of the boat away from the wall when the boat is at the bottom of chambers with greater elevation. (Taking of “selfie” is optional.) When water levels in the Erie system are at normal pool levels, the combings of locks E-13 (Yosts), E-14 (Canajoharie) and E-15 (Fort Plain) are less than 12″ above the full lock’s water level, so fenders must be set both high (to keep the boat off the walls) and low (to keep the hull or boats with high freeboard from contacting the combings when the lock is full). Typical NYS Canal System Lock, with Lock Chamber at the left, and pool retention dam to the right. For planning purposes, we assume passage through a lock will take 30 minutes elapsed time per lock. That is not always the case, but if it takes less time, that just helps our estimated travel plan for the day. For a trawler that makes 8.5 StM/Hr (7.5 kts) through still water, an approximate travel day (first lock at 08h00, last lock late afternoon) on the Eastern Erie Canal and the Champlain Canal will span 8 – 9 locks and involve 40 or so miles of distance traveled. One the Western Erie Canal we travel fewer miles, have fewer locks, and spend more time in the welcoming and historic towns along the canal. Many low bridges, Western Erie Canal. The “air draft” clearance needed for cruising boats is more of a concern on some parts of the NYS Canal System than others. Most guide books report the bridge clearance for the Western Erie Canal at 15.5′. That is definitely true when pool water levels are at maximum navigation levels. If water levels are at normal pool, clearances will be slightly better, but the margin is different for each pool, so it is necessary for owner/operators to accurately know the air clearance required by the boat. Salt water is more dense than fresh water, so cruising boats will draft slightly more and need slightly less air clearance in fresh water. Likewise with full fuel and water tanks. If in doubt, lower equipment, bimini and enclosure frames and antennae to be safe. For current, official details, consult the NYS Canal System website, here: http://www.canals.ny.gov/boating/bridgeheights.html. For cruisers that are equipped with Chart Plotters and/or eCharting software on a PC, iPad or an Android tablet, the NYS Cruising Guide will definitely suffice for paper backup. 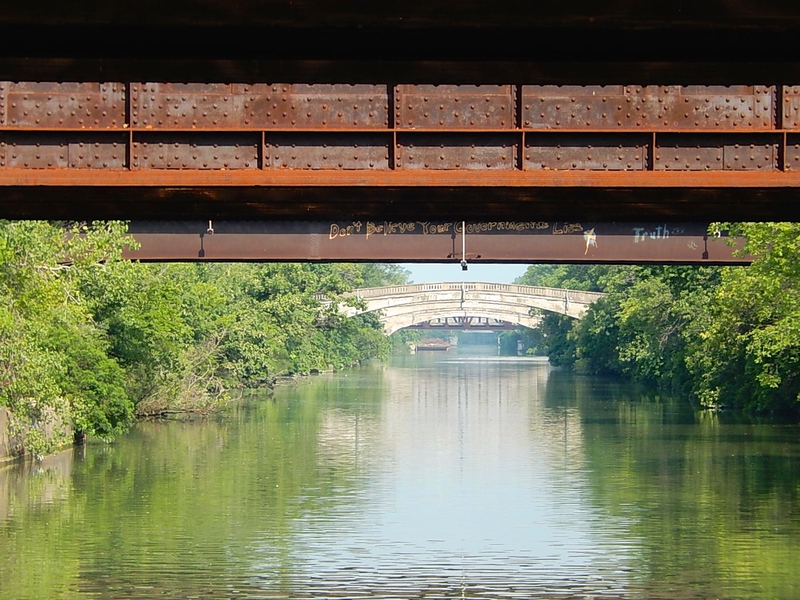 Be aware that only raster eCharts are available for the NYS Canal System. 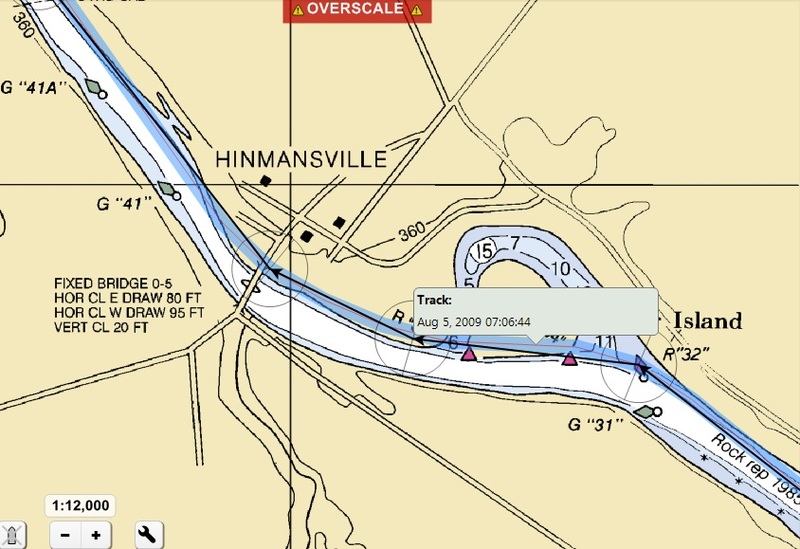 Also be aware that It is not unusual for chart plotters and eCharting software to show boats traveling over/across land in many places, and this will certainly happen in many places along the NYS Canal System. This can be considered “normal” electronic behavior, but of course it does mean that in narrow and unfamiliar waters, a pre-planned route run on autopilot can result in running the boat aground. PLAN AND PILOT ACCORDINGLY. I have tried to explain some of the reasons this phenomenon occurs in a monograph on “Why Chart Plotters Show Your Boat Ashore,” located here: https://gilwellbear.wordpress.com/category/cruising-practica/general-cruising/chart-plotter-puts-boat-ashore/. “Quilting” distortion at the joint between two different charts, typical example, this one happens on the Mohawk River, Erie Canal, New York State Canal System. The NYS Canal System website is also the place to get Local Notices to Mariner’s (NTMs) for canal operations and closures, and to sign up for email alert notices to be sent to mariners. The NYS Canal System is a very well protected inland waterway. With just two exceptions – Oneida Lake and Lake Champlain – there is essentially no open water on the system. Limited open water, beautiful scenery, interesting locks and the variety of quaint small towns makes this region particularly well suited to having non-boating visitors aboard. There are airports at Albany, NY (ALB), Syracuse, NY (SYR) and Rochester, NY (ROC) that are all possibilities for meeting or discharging visiting crew. Amtrak railroad service is available in Albany, NY. Waterford is an ideal location to arrange for the arrival or departure of visiting crew. There is a very nice – wonderful – NYS Canal System Welcome Center for boaters located at Waterford, NY. Space is available first come, first served. Thirty-amp and fifty-amp (30A and 50A) shore power and water, and a coin-operated pump out system, is available here. In recent years, stay durations have occasionally and inconsistently been limited to 48 hours, so check when registering (or, “don’t ask, don’t tell”). I believe the “official” canal system policy limit is two days, but reliable sources tell me this limit is not often enforced, and “… no local judge will find you guilty, unless you also shot the mayor or something”. Please do not shoot the mayor! Waterford is a small town with several very nice shoppes and very good small town restaurants. For breakfast, Don and Paul’s Coffee Shoppe is an absolute delight. The air draft limit on the Champlain Canal will nominally be 15-1/2 feet, but as described later, can be adjusted by 2 feet or slightly more. On the Erie Canal, as far west as the Oswego Canal, the air draft limit will be nominally 20 feet. On the western Erie Canal, it will drop back to a non-adjustable, true 15-1/2 feet. 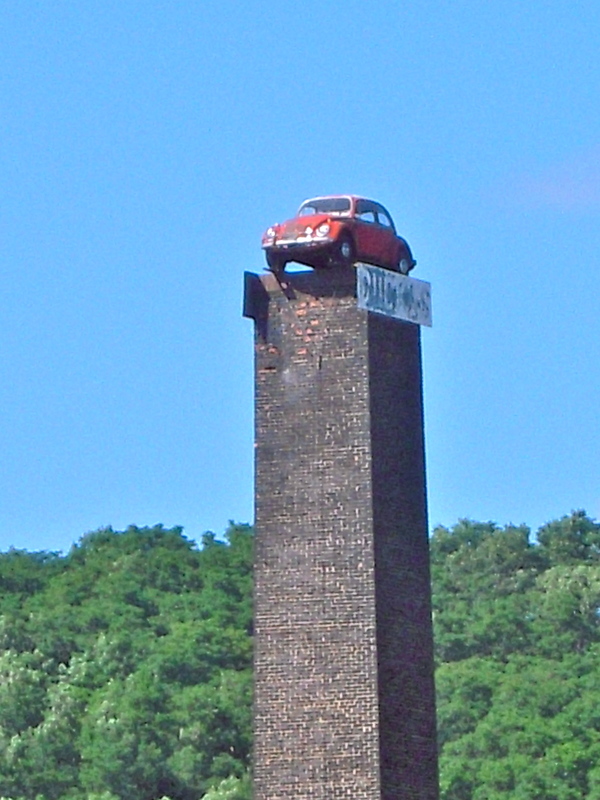 Waterford is an excellent place to lower or remove structures that rise above those heights. RADAR and AIS are of extremely limited usefulness in the Canal System. Sanctuary has a RADAR mast which will not clear some of the fixed bridges on the NYS Canal System. Our mast is mounted in a pivoting tabernacle, and we take the time to lower it and secure it for travel while at Waterford. Also remember to remove dock lines lines and/or fenders that may be stored in deck boxes or lazerettes to which access will be blocked by lowered boat accessories. Water depths will be 10 feet or greater throughout the Canal System. Only road sign on US Waterways? From Waterford, NY, there are two major routes from which cruisers can choose. One runs west into the Mohawk River, and thence on towards the Niagara Frontier. That route is the classic Erie Canal. The second route continues north on the Hudson River. 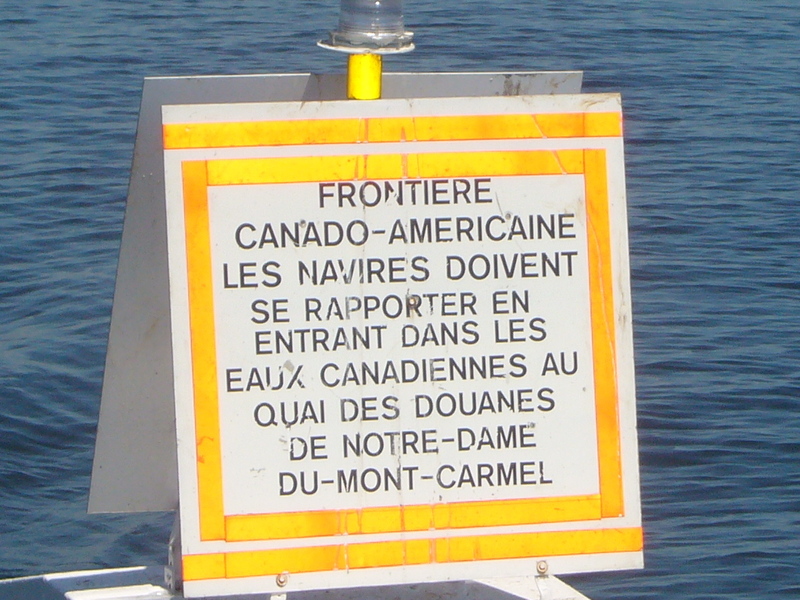 That route is the Champlain Canal, leading to Lake Champlain and French Canada. Both routes are unequivocally magnificent. For Sanctuary and crew, it has been our great delight to have had the opportunity to cruise these routes several times. The NYS Canal System is very affordable, with many wonderful and free little towns all along the way. Champlain Canal, Lake Champlain: Northbound, the Champlain Canal and Lake Champlain are delightful; stunningly magnificent. Sanctuary and crew can testify to the veracity of this statement. The C-3 pool level normally provides almost 16 feet of air draft at the bridge, though it does vary after periods of heavy rains. To “adjust” the clearance of the bridge, the level of the water in the pool must be lowered. 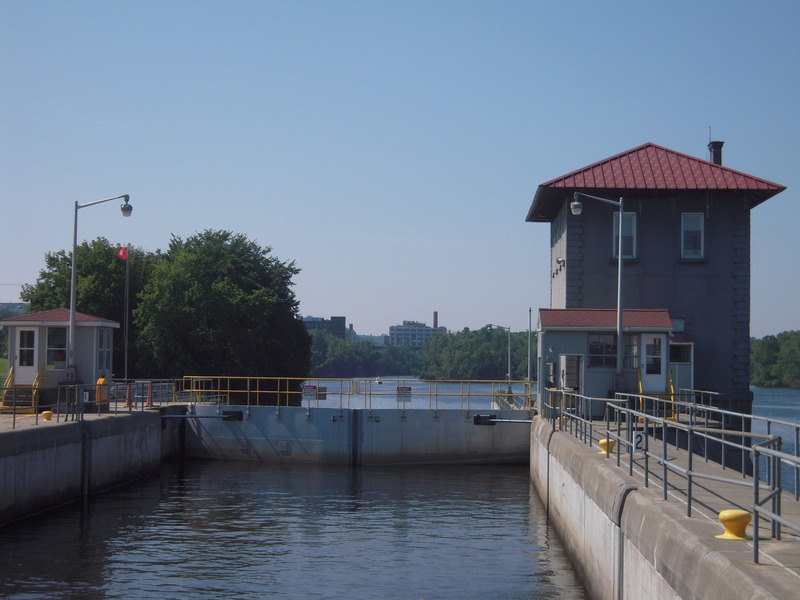 The C-3 lockmaster will call the Niagara Mohawk Power Corporation’s hydro dam, and dam operations will drain off water. That process takes several hours. Dam operations can buy cruisers 2 to 2-1/2 feet of air draft, but that’s all. The pool is a hydroelectric power generating reservoir. In the summer months, dam operations will be more reluctant to lower the pool on a hot, humid afternoon than in the relative cool of an early morning. Plan accordingly. Northbound boats can lay up on the free wall at Mechanicville to wait. There are restaurants within walking distance for lunch, and there is a grocery store and a pharmacy there that accommodates modest re-provisioning needs. Cruisers can also overnight on the dock at Mechanicville, and depart in the morning. Any boat needing the pool level lowered in order to clear the bridge must coordinate and secure pre-arranged agreement through the C-3 lockmaster. 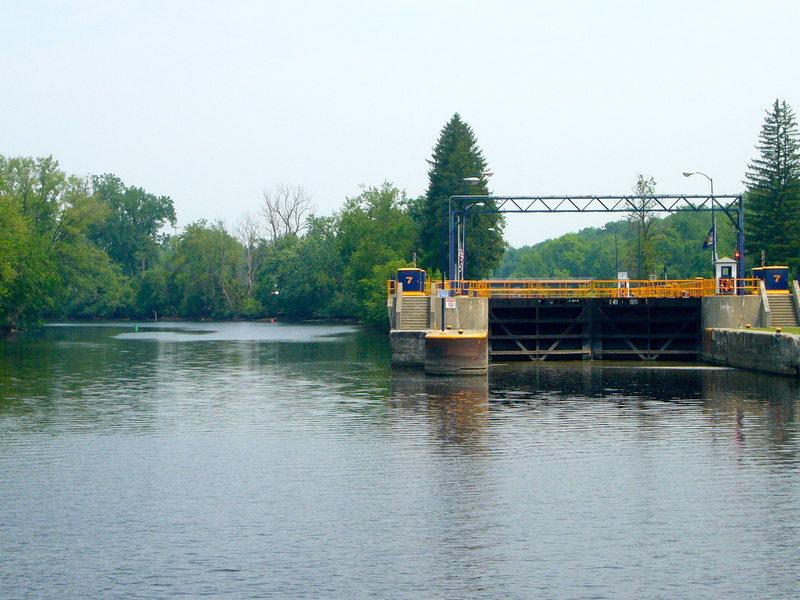 Any boater planning to overnight at Mechanicville and depart in the morning must make sure the C-3 lockmaster confirms the planned departure timing. At Lock C7, visit Fort Edward, NY. Fort Edward Yacht Harbor carries 6-1/2 feet of water at the bridges on the entrance channel. Once past the bridges, stay near the pier. Ft. Edward is a secure and peaceful “Yacht Harbor” with free power and water. 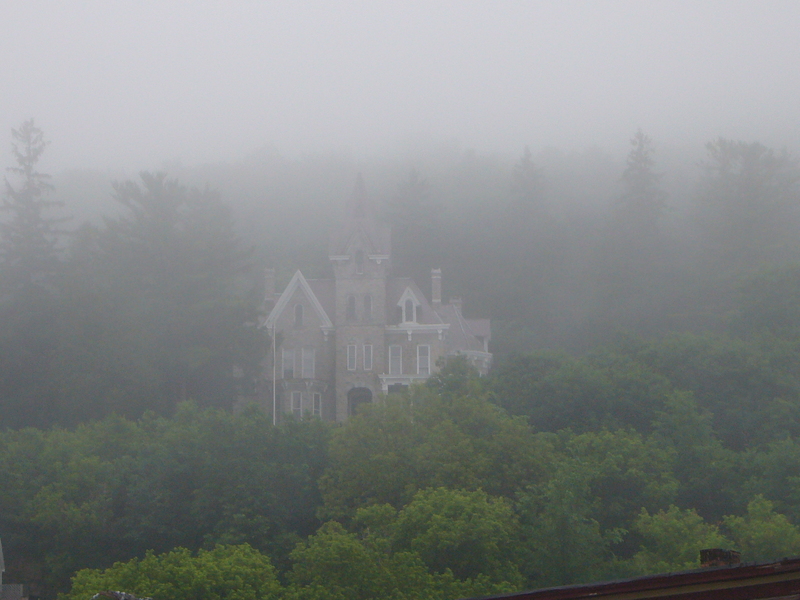 It’s within easy walking distance to small town restaurants and a quaint little town. The grocery is too far out of town to be of any practical value. The Anvil Inn is a great family dinner stop. And if you know Fred Wehner – and every cruiser to this area should know Fred – Fort Edward is Tug 44’s home port. 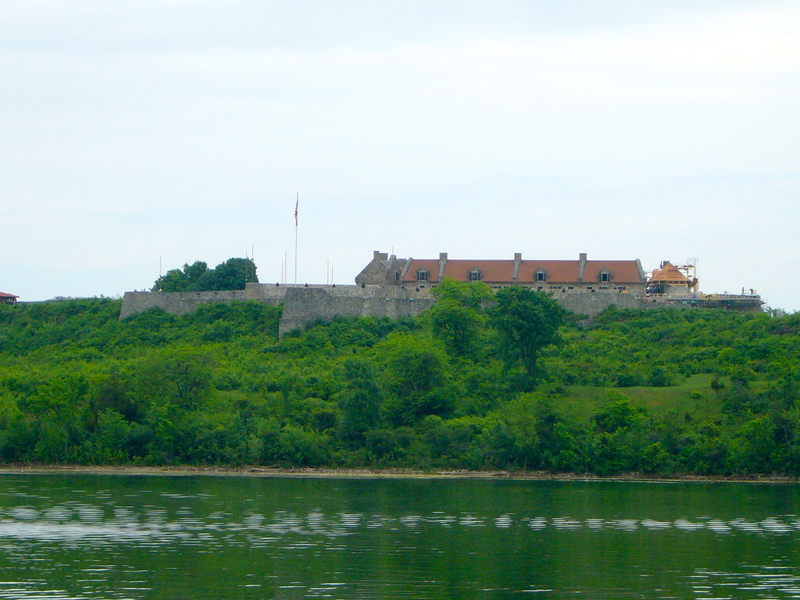 Fort Ticonderoga is a classic revolutionary war era earthenware fortification, but is not designed to be, nor is it easy, to access from the water. Cruisers can anchor in the canal and dinghy ashore. It’s a moderate hike on unimproved trails up the hill! At lock 12, visit Whitehall, NY. Visit Skenesborough Manor. At the Skenesborough Museum, learn that Benedict Arnold may have had cause for what he did, bad though that betrayal of the fledgeling country surely was. There are many, many superb gunkholes on Lake Champlain. There are also many superb marina stops in Lake Champlain, but certainly Vergennes, VT, on Otter Creek, Shelburne Shipyard, on Shelburne Bay, VT, and the city of Burlington, VT, come to mind. The Basin Harbor Resort (on the east shore of Lake Champlain, with a Vergennes, VT, post office) will allow cruisers to day dock. Stop at Basin Harbor to visit the Lake Champlain Maritime Museum. From Shelburne Shipyard, visit the living history docents at the Shelburne Museum. There is an excellent geology and natural history museum on the waterfront at Burlington. Departing Burlington, cruise north to Rouses Point, NY, by passing between Valcour Island and the NYS mainland. This route affords a spectacular view of a positively idyllic setting for any Community College. Tax policy being what it is, fuel may be significantly cheaper in Vermont than in NY. Fuel at Shelburne Shipyard. DEFINITELY, FUEL SOMEWHERE BEFORE ENTERING CANADA. Fuel in Canada will be the more expensive option. The Eastern Erie Canal is mostly comprised of river system with short sections of man-made canals. The waterway is generally wide, and is marked with red and green lateral markers. 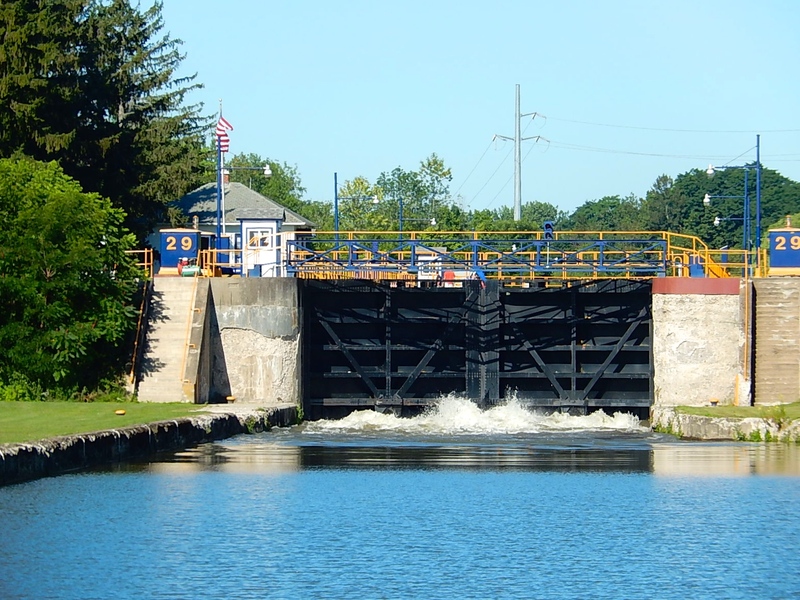 From Waterford, NY, west, the Erie Canal portion of the NYS Canal System starts with a “flight” of five locks, E-2 through E-6. These five locks raise the cruiser’s boat about 180 feet above the level of the Hudson River at Waterford. Under emergency flooding conditions when the lock system is temporarily shut down, boats are sometimes relocate to the pool at lock E-3. However, under normal transit conditions, there is no option to stop while transiting the E-2 to E-6 flight of locks. Transiting these five locks requires about one and a half to two hours of elapsed time. Plan accordingly. A view to the West in the central Mohawk River Valley, near Canajoharie, NY. NYS Thruway runs the south shore, CSX rail bed runs the north shore. Once into the Erie Canal, dilly-dally through the many small and quaint 19th century towns of the Mohawk Valley… Amsterdam… Canajoharie… Little Falls… Ilion… Sylvan Beach… Brewerton… while traveling to the Oswego Canal and the little town of Phoenix, NY. The major central New York cities of Utica and Rome lie between Ilion and Sylvan Beach. Between Sylvan Beach to its east and Brewerton to its west, the almost rectangular Oneida Lake lies along a 25 StM east-west axis. The cruising route across Oneida Lake runs north of Shackleton Shoal, which is marked by a line of Green markers. Honor the markers, which you will accomplish by holding them to your south. The prevailing weather patters in central NY tend to move from west to east: W to E, NW to SE, or SW to NE. Particularly in the summer afternoon hours, check the weather for wind, sea state and short term forecast on the lake. Oneida Lake can blow up into an uncomfortable, unpleasant chop. Summer thunderstorms can be quite strong, and should not be underestimated. At Brewerton, NY, there is a free municipal dock and there are two fine full service marina choices, Ess-Kay Marina and Winter Harbor Marina. Fuel in Brewerton is competitively priced, and is generally below regional averages. West of Brewerton, the character of the Erie Canal changes dramatically. The Mohawk River and the Mohawk Valley have generally undeveloped shorelines; magnificent and wild. From Oneida Lake west into the Seneca River, shores are heavily developed by “cottages” and other development. Posted speed limits range from 10 mph to 40 mph, but in some places, reduced operating speeds will be appropriate. Further west, the Erie Canal narrows into mainly man-made ditch, and reduced operating speeds will also be appropriate. West of Brewerton is the “Three Rivers junction,” (Oneida, Seneca and Oswego Rivers) where the Oswego Canal joins the Erie Canal. The first village on the Oswego Canal is Phoenix, NY. 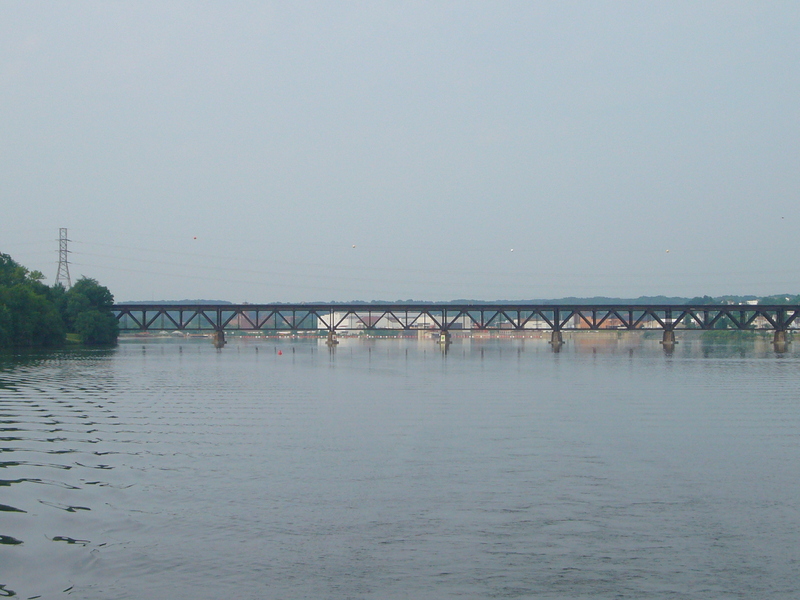 At Phoenix, on the east wall at Lock O-1, check in with the “Bridge House Brats” and enjoy some ice cream with them. There are marina and wall options at Oswego. The Oswego Marina basin is relatively protected from the seas of Lake Ontario. The walls in Oswego Harbor below Lock O-8 are somewhat exposed and can be lumpy depending on Lake Ontario sea state. In Oswego, visit Fort Ontario. 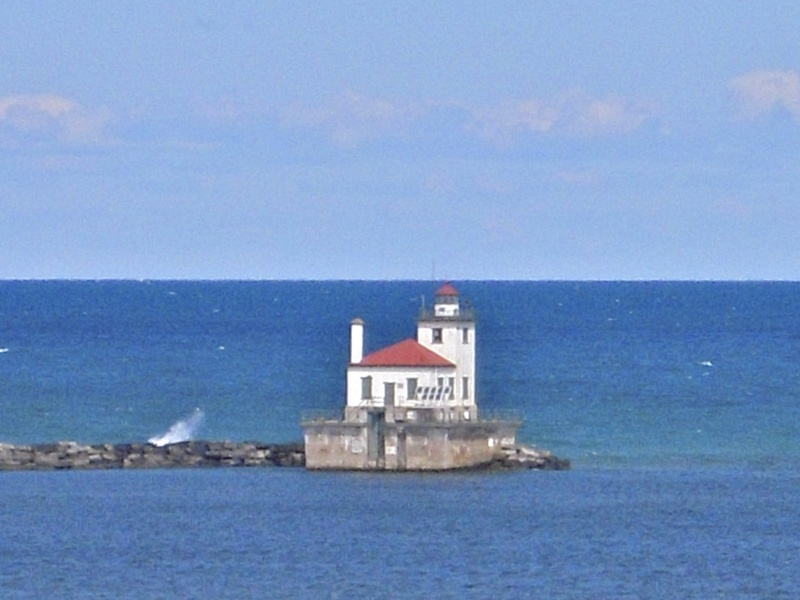 From Oswego, cruisers can leave the canal system to cross Lake Ontario. The cruise to Kingston, ON, is approximately 45 StM. Take on fuel at the Oswego Marina before crossing to Canada. Fuel in Canada will be higher priced. West of the Three Rivers Junction is Baldwinsville, NY. There is a very nice park facility intermediately west of the Baldwinsville Lock (E-24), with power and water for cruising boats. Baldwinsville would be a good place to rent a car for access to Syracuse or the Syracuse airport (SYR). Just west of Baldwinsville, in the Montezuma National Wildlife Refuge, is the intersection of the Cayuga-Seneca Canal with the Erie Canal. Cayuga and Seneca Lakes are the two largest of the NYS “Finger Lakes.” Both lake are navigable to cruisers. The Finger Lakes are deep glacial lakes created by the North American Glacier during the last ice age. Seneca Lake carries almost 600 foot depths. During WWII, Seneca Lake was home to a military training center used to train submariners in deep dive skills and techniques. At what is today Sampson State Park, there is a NYS public marina and small museum where this training was headquartered. Wonderful town stops in these areas include Seneca Falls, Geneva and, at the foot of Seneca Lake, Watkins Glen. This area is the heart of New York State “wine region.” Several wineries have docking facilities available for cruising visitors. The famous Christmas movie, “It’s A Wonderful Life,” starring Jimmy Stewart, was filmed in Seneca Falls. Also at Seneca Falls is the Women’s Rights National Historical Park. This US National Park Service site commemorates Elizabeth Cady Stanton and the women’s suffrage movement. An NPS site, the Golden Age Passport is accepted here for free admission. Westbound on the Erie Canal from the Cayuga-Seneca Canal to the Niagara Frontier, cruisers will have to lower virtually everything aboard to get down to less than 15-1/2 feet of air clearance. If pool levels are at maximum navigational limits, there is no available tolerance in this clearance. When passing beneath low bridges, be especially alert to other boats moving at speed. Even small wakes can cause your overhead clearance to go to zero, or to go negative! Oops! In the summer of 2015, there were great cruising stops at Newark (24-hr limit, free), Fairport (no stay limit, free dockage, modest daily charge for electric, free pumpout), Pittsford (24-hr limit, free), Spencerport (24-hr limit, free), Brockport (24-hr limit, free dockage, fee for electric), Albion (24-hr limit, free), Holley (24-hr limit, free), Medina (24-hr limit, free) and Lockport. These stops all have rest rooms, many have shower facilities, some have wi-fi and pumpout. The Black Rock Canal at Tonawanda/Buffalo leads to Lake Erie via the Niagara River. 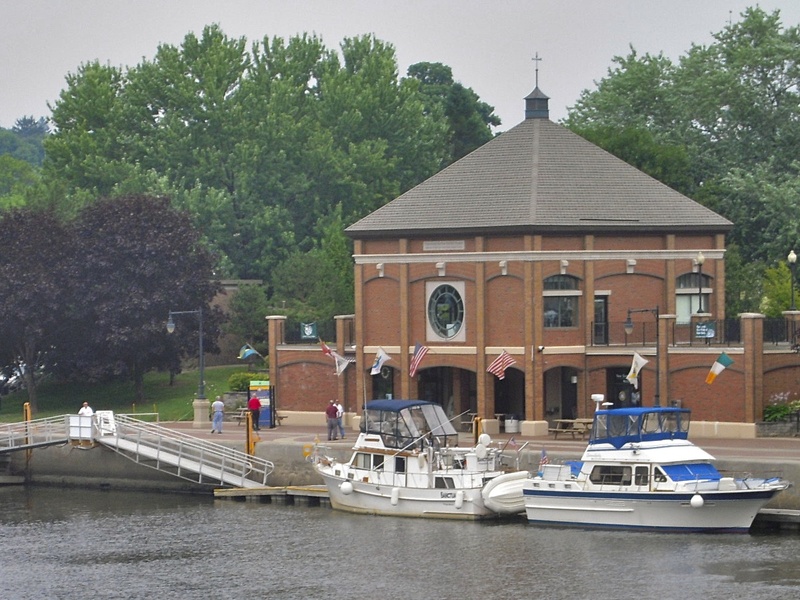 Waterford – Erie Canalway National Heritage Corridor Visitor’s Center, Matton Shipyard (remains) where wooden canal boats were built. Rome – Erie Canal Village, 5789 New London Road, Rome, NY 13440; http://www.eriecanalvillage.com; three museums, blacksmith shop, schoolhouse, livery stable, church and RR station. Ride on a horse-drawn canal boat. Chittenango – Chittenango Landing Canal Boat Museum, 717 Lakeport Rd, Chittenango, NY 13037; http://clcbm.org; dry dock where canal boats were built, blacksmith, sawmill, warehouse and woodworking shop. Camillus – Nine Mile Creek Aqueduct, 5750 Devoe Road, Camillus, NY 13031; http://eriecanalcamillus.com/index.htm; museum, restored aqueduct. 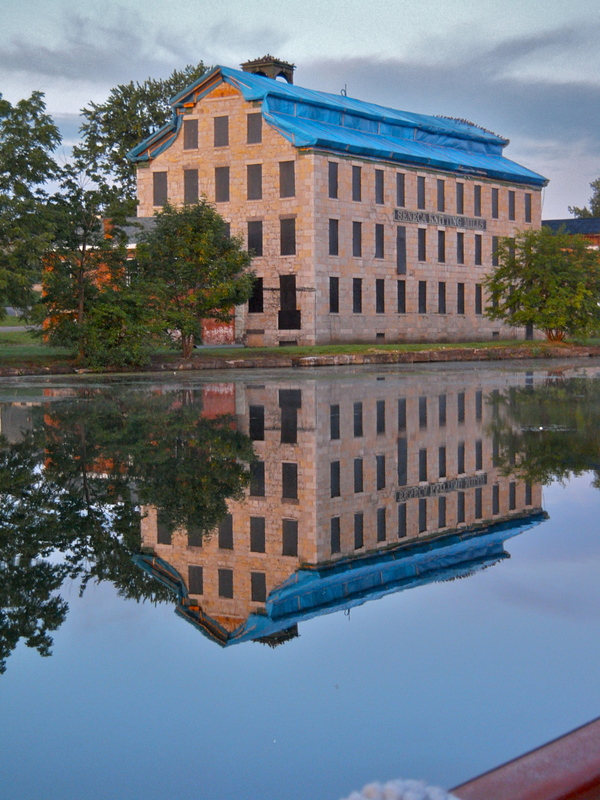 Lockport – Erie Canal Discovery Center, 24 Church Street, Lockport, NY 14094; http://www.visitbuffaloniagara.com; and “flight” of five original locks alongside todays modern locks, E34 and E35. Enjoy the NYS Canals as a cruising destination. They will not disappoint. This entry was posted in NYS Canal System on 2013/01/07 by gilwellbear.